Game Description: MORE CARDS. MORE STRATEGY. BIGGER STORY. Summon mythical creatures. Cast legendary spells. 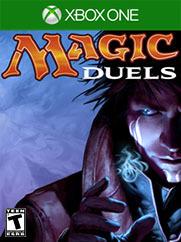 Match wits with your opponent and emerge victorious in epic online duels. With hundreds of earnable cards and countless strategies, building your deck and challenging your friends in Magic: The Gathering has never been more fun. NEW STORY: In the new Shadows over Innistrad update monsters stalk the night, horrors flit in the shadows, werewolves prowl the forests, mad scientists create monstrosities in hidden labs, and noble vampire families openly vie for power and control. Only you can stem the tide of darkness. NEW CARDS: More than 300 NEW unique earnable cards from Magic’s Shadows over Innistrad and Oath of the Gatewatch sets, along with NEW Story Content, NEW Skill Quests, and more. MANY WAYS TO PLAY: Experience some of Magic’s most iconic moments in Story Mode, head to Battle Mode to take on your friends, or grab a partner for a four-player Two-Headed Giant battle.